This conical, deciduous tree has a thorny trunk and shoots and bears glossy green pinnate leaves that turn yellow in autumn. Pendent, twisted seed pods up to 12 inches long are produced in the fall. Height 70 feet; spread 40 feet. 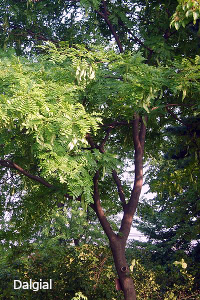 The genus Gleditsia is now in the family Leguminosae. For maximum freshness, please keep seed refrigerated in its original packaging until it is time to plant. Sow scarified seed in containers in an open frame in autumn. Grow in any fertile, well-drained soil in full sun.